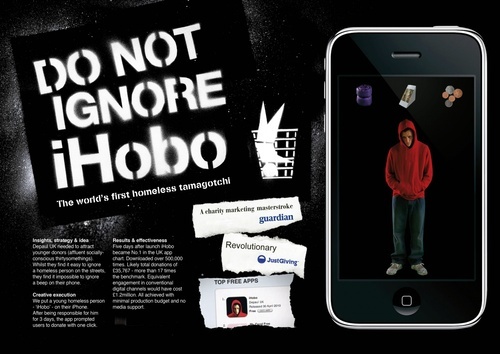 Youth Homelessness - Mind the blog! Amazing how an app can change the way we see things. First the tamagotchi aspect repulsed me but at the end of the video, I was convinced the app was the right trick to make people understand and donate. It's amazingly creative and effective. Wow... That's just... Well it make think a lot. I'm really affected by the stuff you posted, particularly the young homeless person's portraits telling their story. All this informations and campaigns are really effective, we really need to act, I noticed most of this youth have familial problems, many are abused. I think an efficient way to prevent youth homlessness would be to help the teens who know this kind of problems, they need to be put under protection, to be offered another place to live. It's really revolting to see all this facts. This really changed my week end you know, I was complaining because of the Bac and the work we have to do, well that was so selfish ! I realize I just have the chance to have a roof. As I said, it makes think a lot. those adds are very interesting and well, i'll say efficient. the three first ones make us think about the fact that we pay more attention to objects, superficial things, than human being, human's life. we can see the "possibilities", the "promises" and the potential" of a chair a plant or any other stuff but we cannot see this of a homeless youth when we see him in the street. About the ihobo, at first i thoughtit was horrible to compare human being to a toy, but at the end i saw and i anderstood that it was a good application for smart phone in order to make them aware about how frail a homeless's life can be and how easily his life can change when we don't care about them.